Three civilians were killed Sunday when a Phoenix firetruck crashed into a passenger vehicle, according to local authorities. 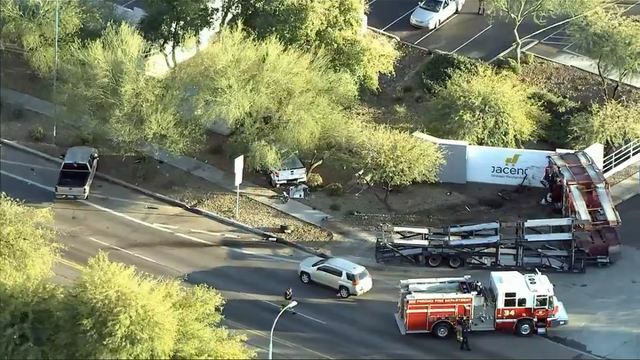 Phoenix police told CNN affiliate KTVK the firetruck was on its way to a structure fire nearby when it collided with a pickup truck around 9:15 a.m. local time. Sgt. Vince Lewis told reporters the deceased were an adult male, an adult female and a child, approximately 6 months old, who had been in a child’s seat in the rear of the vehicle. The cause of the accident was being investigated Sunday afternoon, said Lewis. Investigators with the vehicular homicide unit had not determined a cause. The truck had its lights and sirens on, KTVK reported. Three firefighters were taken to the hospital, Lewis said, but by Sunday afternoon they were in stable condition. The accident occurred near the area of 29th Avenue and Bethany Home Road.